Poured from 22 oz bomber to pint glass, 4/20/11. A - Cloudy dark orange with 1 finger head. Lacing is good, retention is not. S - Smells great. Tons of citrus hops with a touch of earthy pine in the background. Just outstanding. Very little malt scent, which is how I like it. T - Some bitterness and an assault of citrus upfront. The citrus mellows midway to a somewhat dry piny finish. Bitter orange peel lingers forever. Such a great example of the style. M - Is good, but not smooth and creamy like Pliny or Sculpin. Medium body suits the beer well and the finish is very dry. Carbonation is medium low. O - A great west coast IPA that may become a mainstay in my fridge. Good hopping without being overly sweet and a lovely, lingering finish. I'm happy that I live just a few minutes from the brewery. This is my favorite beer of all time. I've never gotten round to reviewing it, but here goes. I may not feel this is 5 across the board anymore, if I look at it critically, but my rating stays. Pours a clear orange, with soft white foam. Leaves quite a bit of lacing. The smell is the quintessential west coast IPA. Crisp and citrusy, with oodles of piney resin. The taste, oh well, the taste. Quite bitter and piney upfront, the back is tempered by loads of citrus. Just perfectly balanced, and the taste lingers in your mouth for ages. Medium bodied, oily, perfect carbonation. Well, lives up to my nostalgia, even after having many, many world class IPAs since having this last time. If I could ony drink one beer for the rest of my life, this is it. I absolutely love this brew. It was the first legit west coast IPA I got my hands on in the Midwest. Never disappoints, great balance, taste, and smell. Outside of Pliny, this and Apline Duet would be my top choices for 'last beer on earth'. I have passed this beer up sooooo many times just hoping I will one day find a fresh bottle to enjoy. Finally the time has come and I am severely impressed by this ipa ! I honestly can not think of a much better example of the style . . . This may be my new standard for an American ipa. Along with the likes of Racer 5, Two Hearted, Columbus and Anti-Hero. Alesmith ipa is beautiful in appearance. Aromas are floral and tropical. Feel is smooth and creamy with substance. Taste is hoppy but not over the top so much it will burn you up after a couple. Overall, possibly the perfect example. Palate destroying, citrus-y goodness. This IPA defines west coast. I know it is craft beer heresy to say this, but given the option of Alesmith IPA, Blind Pig, or Sculpin, I am going Alesmtih. This is the perfect IPA, in my opinion. Love this beer. I got this pretty fresh on the East Coast. Thankfully, it’s now dated. April 3, 2013. It pours in a hazy golden orange color with a head that quickly dissipates. The aroma has a huge amount of hops of citrus. Sweetness, tropical fruit, West Coast pine. The flavor hits you with a wonderful bitterness of papaya, peaches, grapefruit, tropical fruits, and then biscuit sweetness. Then the finish has a wonderful big pine flavor. In the end, this is up there for me for IPAs. I have this near Maine Co. Lunch. It’s just an amazing IPA. It’s truly a complete beer with its tropical and pine hops, but then that strong malt. Be sure to have this cold, as this warmed up, it slowly lacked flavor and was a bit malty for me. Having it cold, I noticed more aroma and fruit, and just the complexity that this beer as to offer. I gotta say, even for the significant age of this ipa, it's certainly my favorite. It was a bit hazy, amber/gold. About a fingers worth of head. A good looking beet for sure. Slight citrus not on the nose, but pine is definitely more at the forefront along with the malts. The taste is similar and spectacular. It has a great deal of piney bitterness, but iy is SO well balanced by the malt, not too overwhelming, but definitely not too sweet. It felt like a craft soda, small bubbles for a silky mouthfeel. It was damn- near chuggable. Overall, it speaks well of the west coast style. It's sure to satisfy. Classic, silk-screened white lettering on a dark brown 'bomber' bottle. This is my first AleSmith beer and I'm expecting great things. Slightly hazed, orangish peach that should become significantly more clouded on subsequent pours as the yeast find their way into the glass. The head is light toffee in color and is stiff, sticky and pitting. There's plenty of lace already and the cap has just begun to recede. Ultimately, the glass is coated with a huge amount of thick, chunky lace in rings and sheets. The aroma is 'hop heaven'. Loads of citrusy hops are atomizing themselves purely for my olfactroy enjoyment and I couldn't be happier. Clouds of orange peel and grapefruit peel essence--along with fresh pine--fill the room. I can't imagine that this aroma could be improved upon. The flavor is, in a word... fabulous. Massive quantities of citric hops must have been used in the brewing and it shows. 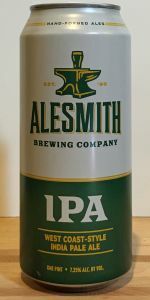 In fact, AleSmith IPA strikes me as a 'tweener', a beer that occupies that fuzzy zone between the IPA and DIPA styles in terms of flavor, hoppiness and ABV. The initial impression is of a solid wall of juicy hops rolling across the tongue, followed by a glimmer of toasted malt that tries vainly, but ultimately in vain, to stand up to the resinous hop attack. That's not to say that the flavor profile is overbalanced toward the hops, just that they're clearly in charge and both parties know it. The malt provides the sweet, cake-like underpinnings that allow the hops to run rampant and assault the tastebuds with some (minor) degree of restraint. A balancing act par excellence. I think it's pretty apparent by now that I truly love this beer, but let's continue. The finish is a never-ending sweetsticky symphony of hops; again, tempered by the ever-present, but never intrusive, toasty caramel malt. The body is big, but not huge. This is no Dreadnaught, but I can't think of an IPA that has a creamier, silkier, smoother, bigger body. The alcohol is hidden exceedingly well. It's only evident in a slight warming (in my stomach and in my soul) as the bomber disappears. Quality, quality, quality. AleSmith IPA is neck-and-neck with my favorite IPA/DIPAs so that any differences in score are trivial at best. It isn't available in this state, but it is available on-line so that I have a ready supply if I so choose. And believe me, I choose in a big way. If you love IPAs and haven't yet had AleSmith's inspired version, it's worth whatever effort and expense that is required. My first AleSmith brew! Pours a beautiful orange hue (I rhymed). Off white foam and moderate lacing. Smell is glorious - grapefruit and juicy tangerine. Taste has a nice malt backbone with grapefruit and tangerine - the finish has lingering, bitter floral hops. A nice creamy mouthful. Definitely a candidate for my favorite west coast IPA. Just found this in a six pack at my local store, So much better than buying the 22 oz Bomber Bottles. This is my favorite IPA Beer. A must try for any IPA Beer Lover. From a bomber dated 1/27/15. A rather well balanced IPA...not exactly what I expected from a SD brewery but pleasant nonetheless (although I certainly don't object to hop bombs!). The bready maltiness actually dominates on both the nose and tongue for me. The fruity and bitter elements from the hops are there but pretty subtle when compared to a lot of other west coast IPAs. This is a real quality brew, but, considering the cost, I'm not sure I'll come back to it anytime soon....a couple more bucks will get me a sixer of some other great stuff. A - Hazy orange copper with a dense white head. S - Huge mango and tropical fruit aroma. Amazing. T - A blast of juicy tropical fruit and dank, earthy hops. Somewhat bitter. Spectacular. M - Medium-full body, smooth, dry. Sticky. O - This is no doubt one of the best beers brewed in the U.S. A quintessential west coast IPA. A- Dark orange body out of the light. But in the light, the body color is a nice honey, yellow color. It is on the hazy side, but I do not notice any sediment in the beer. The head is 2 finger, frothy, and bright-white in color. Head died to a nice 1 finger in size. It is leaving some very nice lacing. Great looking west coast style IPA> But as of lately, I'm really fond of the New England "hazy" IPA/Pale Ale look. S- Lots of pineapple and sweet bready malts. I also get the typical grapefruits in there as well. I detect some caramel notes as well. Light notes of pine and leather. Pretty standard west coast IPA, but good. T- This is how a good west coast IPA should taste. It's fairly balanced between the hop notes and the malty taste. I notice that compared to New England style IPAs that this has a darker, caramel malt, kind of taste. Upfront I get the pineapple and grapefruit notes. Light pine notes and some oily, resinous notes. Slightly dank towards the end, but I'd say Alesmith IPA finishes fairly clean. It's not overly dry. F- The body is medium in feel. It's crisp, clean, and pretty refreshing. This doesn't quite drink like citrus juice in the way some New England style IPAs do, but I'd say the drinkability is quite high on this. Overall this is a great tasting west coast IPA. It's not too bitter at all. And it's not super, super dank. I can't stand an IPA or Imperial IPA that is way too hoppy and dank. It's almost undrinkable to me. This is really well balanced between the malts and hops. I tend to like the IPA's that are on the citrus juice side of the mouthfeel, but this a great IPA I would never hesitate to drink when I'm in the mood for this style. Appearance  Orange amber, with nice carbonation. The head is white, thick, creamy and has huge staying power. The lacing is also excellent. Smell  Pine for the most part, but also citrus and a little bit of alcohol. Good floral hop character, perfect for an IPA. The excellent head really holds onto a lot of the aroma so the smells are not as strong as in many IPAs. Taste - Hops obviously dominate, one of the fresher tasting IPAs Ive had. Pine mostly, but grapefruit also comes to mind. There is some malt as well, but it is completely dominated by the hops. It is very hoppy, but no where near the bitterness of many IPAs, just a subtle lingering bitter aftertaste. The alcohol is missing at first, but becomes more present as the beer warms. Mouthfeel - Creamy, with a mildly prickly carbonation on the tongue. Creamy auburn coloring with a less than generous head, but respectable cloudy lacing. The nose is grand, spicy and not surpisingly very hoppy. The nose and the taste are both a bit roasty, distinguishing it from it's contempraries. I am always a little surprised when I come across an IPA that's this balanced. The malt texture is more than a match for the outstanding level of hoppiness. Sweet, creamy, and lively on the tongue. Outstandingly drinkable. Why, oh why did I wait this long to try this beer? A - A beautiful gold tinged with orange hues and a clean white head. S - Hop fruitiness (oranges, pears, grapefruit) with some earthy lemongrass notes. T - The hop fruitiness hits you first with some citrus and berry flavors. The fruitiness ends with hints of grapefruit that segues nicely into a sweet maltiness. The grapefruit also transitions into pure hop bitterness that closes the sip. M - Medium body with medium carbonation. O - This is probably the best IPA I have ever had. The hop complexities and maltiness combine for a very well-balanced brew despite finishing with a pleasant lingering bitterness. The smell and flavor profile are amazing. With a taste this good and an abv of only 7.25 make this an incredibly drinkable beer. 355ml bottle poured into a snifter. Classic mildly hazed orange amber hue with very good dense head formation of creamy foam comprising of vast small effervescence that won't really die down with exceptional strength of retention, it just a little bit collapses to a thick layer of eternal foamy crown and yields plenty of refined lacing ring, patch and spot all along the way. The aromas are all that I could imagine from great IPA, well hopped, grapefruit, tangerine, orange peel, tropical fruit, lime, pine, resin, floral, and with very good malt in the support with its sweet, biscuit, and slight caramel, very well mellow and inviting aroma overall. The taste is well-rounded and very balance between malt and hop. Malt plays in the supporting role with its caramelized sweetness and breadiness while hop leads forefront with its rich fruitiness of grapefruit, tangerine, orange peel, lime, tropical fruit, and pine needle. The middle to finish is wrapped up by persistent resiny bitterness from hop that is quite lasting for long in the aftertaste. Medium body with smooth mouthfeel from its good crispness and lively carbonation generated refreshing feel through the palate, finish is pleasantly dry. This brew is that the American IPA is all about. It is perfectly balance and possesses all the characters which must be visible. This one couldn't be missed.